Open radical cystectomy with pelvic lymphadenectomy remains the gold standard for patients with clinically localized muscle-invasive bladder cancer. Other indications for radical cystectomy include carcinoma in-situ (cis) or high-grade tumors refractory to intravesical chemo- or immunotherapy, or recurrent multifocal superficial tumors unable to be managed adequately with repeat transurethral resection. With the advent of laparoscopic/robotic technology, cystectomy can also be performed using minimally invasive surgical approaches. 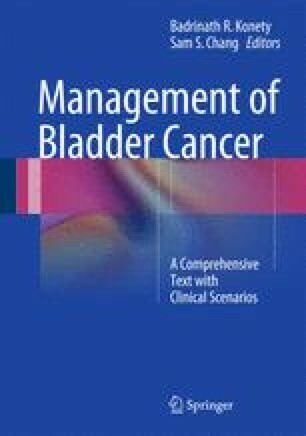 Ongoing multi-institutional randomized prospective trials are evaluating whether safety, oncologic control, clinical outcomes, and cost efficacy are comparable between the two techniques. Preoperative considerations, including full staging, neoadjuvant therapy, type of diversion, and preparation for surgery are all of paramount importance in preparing for radical cystectomy. Surgical technique specific to male and female cystectomy will be discussed, as well as pelvic lymphadenectomy and form of diversion. Lastly, postoperative management and early and late complications are outlined to help guide accurate and forthright discussions with the patient.